Operation Bedroll is a joint project of the USC School of Law Library and Pro Bono Program. The goal is to re-purpose clean, used plastic bags into bedrolls for the local homeless population. Bring your plastic bag stash to one of the collection boxes located in the pantry across from the Pro Bono Office, the Reference Desk in the Law Library and near the microwave in the Commons. The bags will be collected and repurposed into “plarn” plastic yarn! The plarn will be crocheted into bedrolls! Why are plastic bedrolls best for the homeless population? The plastic web creates a barrier between the person, sleeping bag or blanket and the ground, resulting in less loss of body heat and a drier surface There are a myriad of reasons why someone is sleeping outside, sometimes by choice and other times because they have fallen on hard times. Homelessness is complicated but as human beings they deserve our kindness and care, It can all start with a plastic bag! This entry was posted in Administrivia on 31 October 2017 by Pam Robinson. You did it! The goal of Harvest Hope-oween was to collect 10,000 pounds of food and money for Harvest Hope Food Bank. Your reward as promised! Dean Wilcox is springing for pizza for everyone who participated. Join us in the courtyard on Tuesday, Oct. 31st. at 12:30! See you there and don’t be afraid! THE ABA has designated Oct 22-28 as Celebrate Pro Bono Week. It is a time to highlight the amazing efforts to help those in need with legal assistance. As much as we celebrate the ongoing efforts this week it is important to be engaged with pro bono activities all year long! Like Law School! Use this week to take a few moments to peruse the myriad of opportunities listed on the website http://law.sc.edu/pro_bono and decide what works for you. How do you want to make a difference? It is never too early to start rounding out that application. Prove to potential employers that you are more than a brain but that you have heart! The ethic of pro bono services is fostered in law school and can shape a successful career! This entry was posted in Celebrate Pro Bono on 25 October 2017 by Pam Robinson. and so are many things but hunger should not be among them! We may need professional help to get over our fear of snakes ( not going to happen!) but Harvest Hope Food Bank works hard every day to overcome South Carolinians food insecurity. Now we can do our part to help! Bring in your cans and bags of non-perishable food to the Student Commons anytime between Oct. 23-27th and watch the thermometer rise as we aim for 10,000 pounds! A very tasty surprise awaits everyone if we reach that goal- thanks Dean Wilcox. Make this a Happy Harvest-Oween! This entry was posted in Harvest Hope Food Bank on 20 October 2017 by Pam Robinson. Hunger is NOT a Crock (Pot) and Harvest Hope-oween is coming! 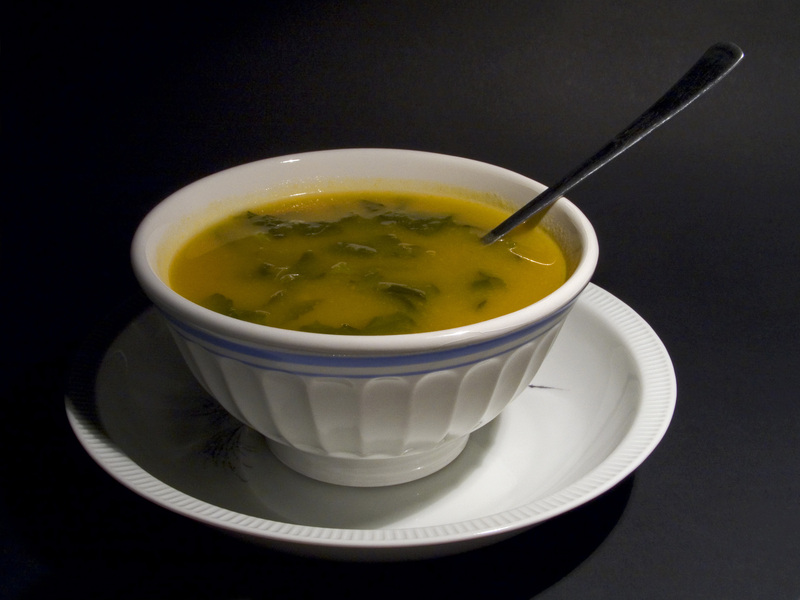 The Lobby of the Law School will be filled with the enticing smells of soup on Oct. 26 from 12:30-2 and for just $5 you can enjoy tasting as many entries as you want- all to help a good cause- Harvest Hope Food Bank. 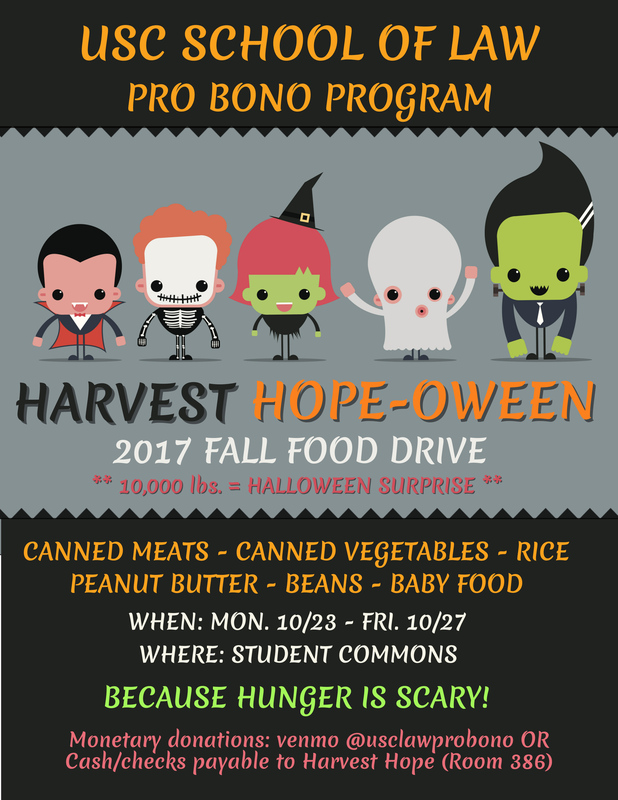 “Hunger is NOT a Crock (Pot)” is just one element of the Law School “Harvest Hope-oween” an effort to educate and address the issue food insecurity in SC. Harvest Hope-oween is being held during the week of Oct. 23-27th. . Collection boxes will be in the Commons. 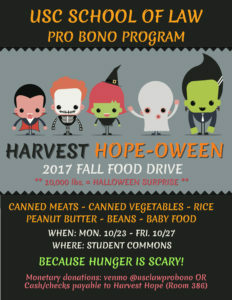 Challenge your classmates, your professors- pack your lunch and donate what you would have spent to Harvest Hope Food Bank. With a 20 county service area Harvest strives to bring quality food to those without with dignity, compassion and education. When the shelves are bare, someone skips a meal! Harvest Hope depends on the good will and generosity of donations to bridge the hunger gap. This entry was posted in Harvest Hope Food Bank on 16 October 2017 by Pam Robinson.